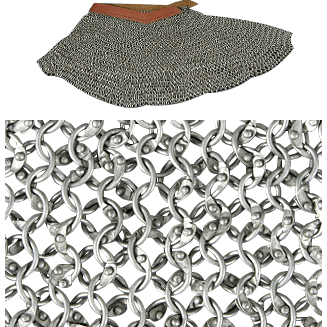 Serving as a curtain of chainmail around the throat, neck, and shoulders, an aventail or camail connects to the helmet of a warrior. 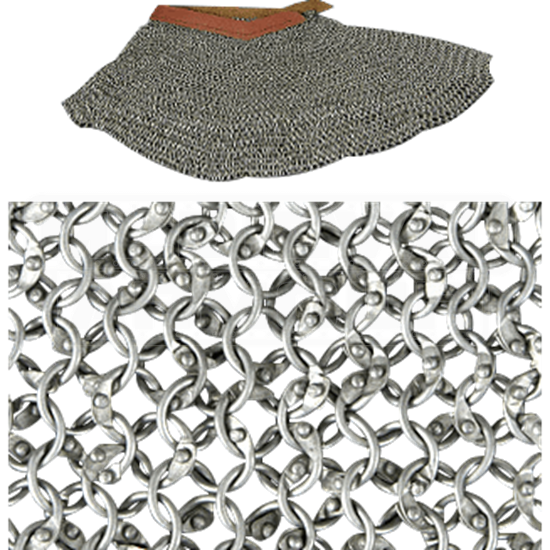 The Knight Grade Chainmail Aventail attaches to the base of a helmet with a leather band. Aventails gained popularity in place of the mail coif by the late 15th century. This style of dome-head riveted mail with round rings is reasonably authentic to the early medieval period. This construction style has the advantage of strength, allowing it to be used for supervised weapons-contact re-enactment, while being more economical than wedge-riveted mail. This item is crafted from 16 gauge mild steel. Construction is in the 4 in 1 pattern.